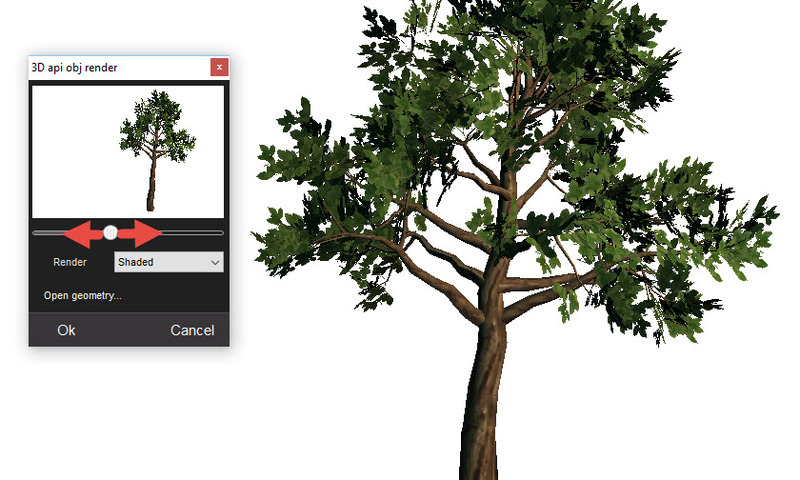 As of PD Howler version 11.2c (RC107), there is a 3D viewer/renderer for OBJ files. 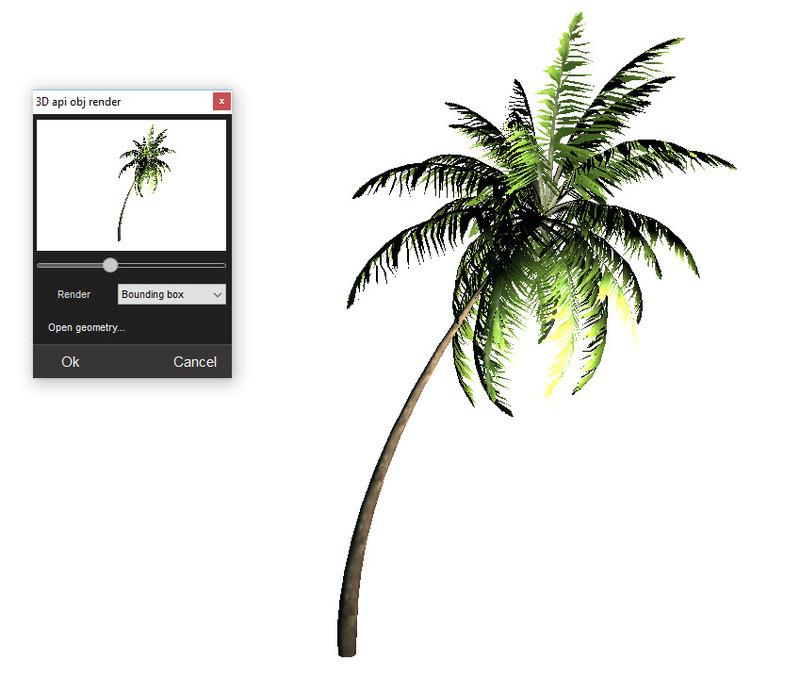 (1) Use the slider to spin the loaded object. 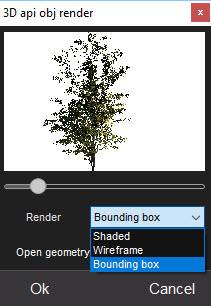 By default it shows it as a bounding box. When you let go, it renders it. Note: it renders it against the current background. 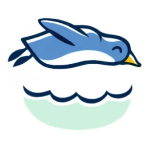 If you plan to use the rendered view as an asset with transparent background, you'll probably want to first clear the image to a single color such as blue or white. On the other hand, you can use this to render it next to others, prior renderings at different positions and orientations. 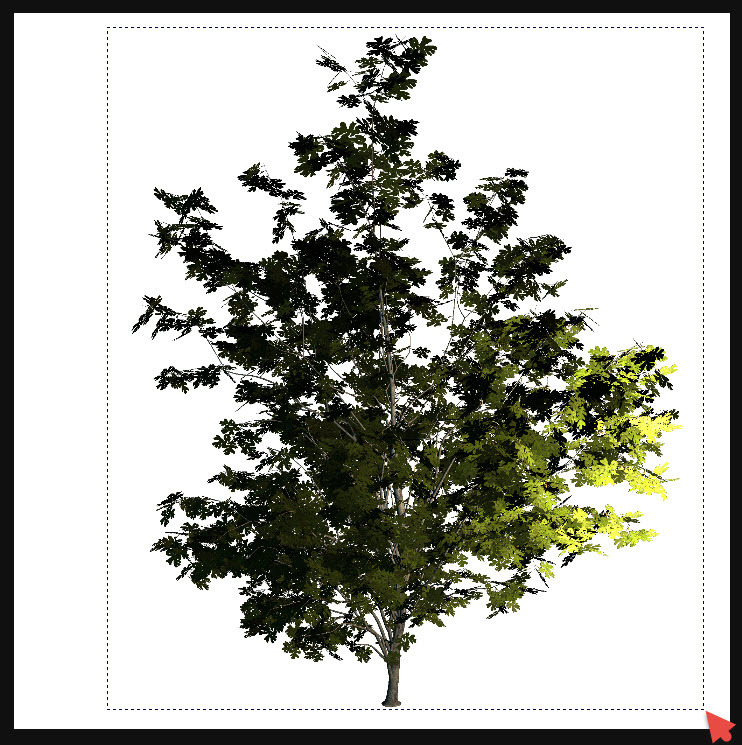 Perhaps to create a spritesheet of the same tree in various angular orientations, to then pick them up as custom animbrush of several trees. 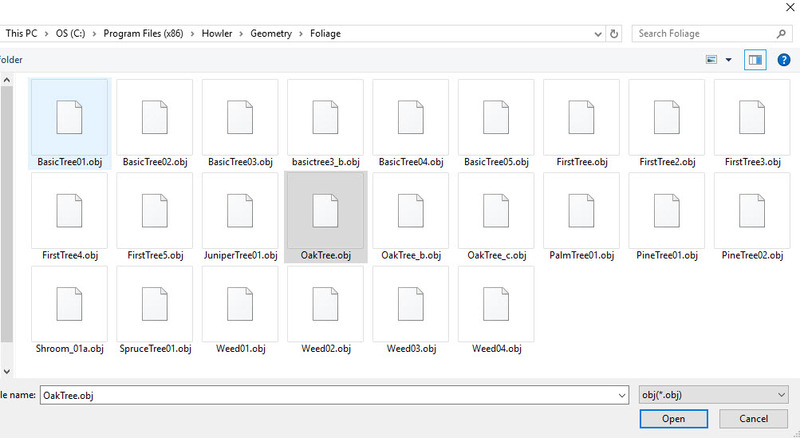 We have included a small collection of OBJ files describing tree objects. Pick one and open it. If you're on a slow system, try the smaller ones first. The Weeds are comparatively small. 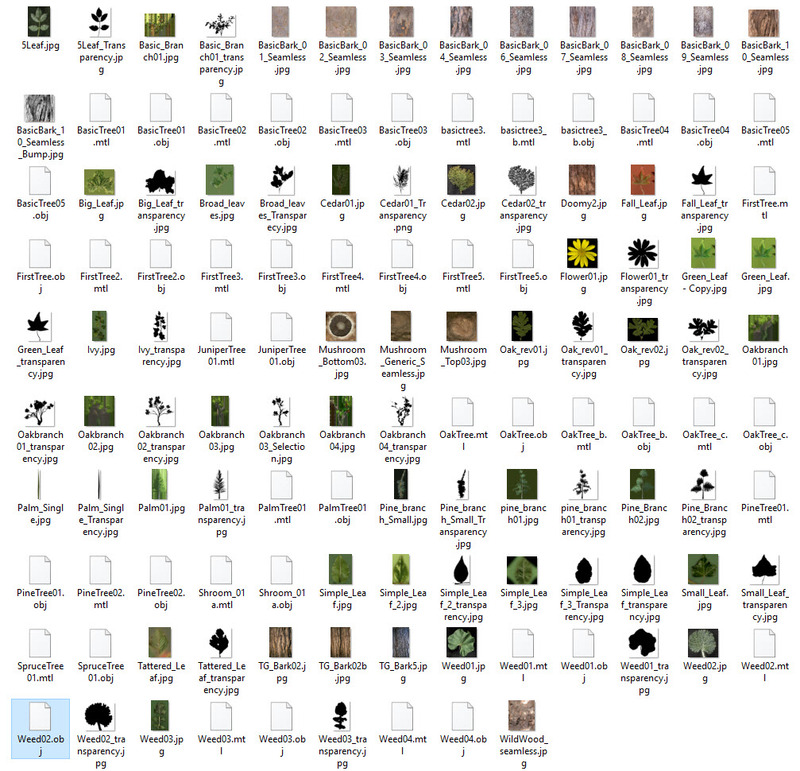 Here we're going for the OakTree, which is on the more detailed, large side. The loaded object gets rendered. 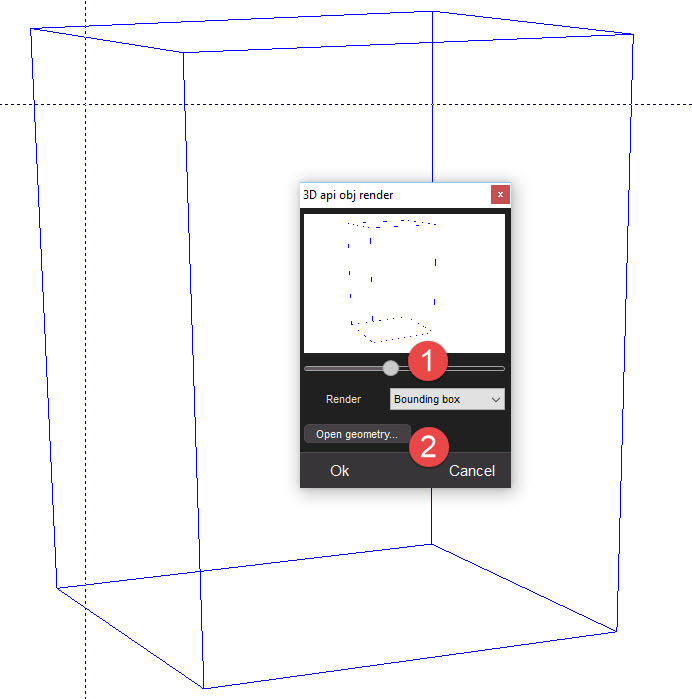 Use the slider again to view it in Wireframe mode. Here is an example with a different tree. You can recognize that the tree contains the geometry of tubular trunk, branches and twigs, and also some rectangular shapes (or squares) near the ends of the branches, sometimes along the branches too, which carry the images of the leaves. If your graphics card and CPU are fast enough, you may want to use the fully shaded mode. Here we loaded another one of the oak trees. 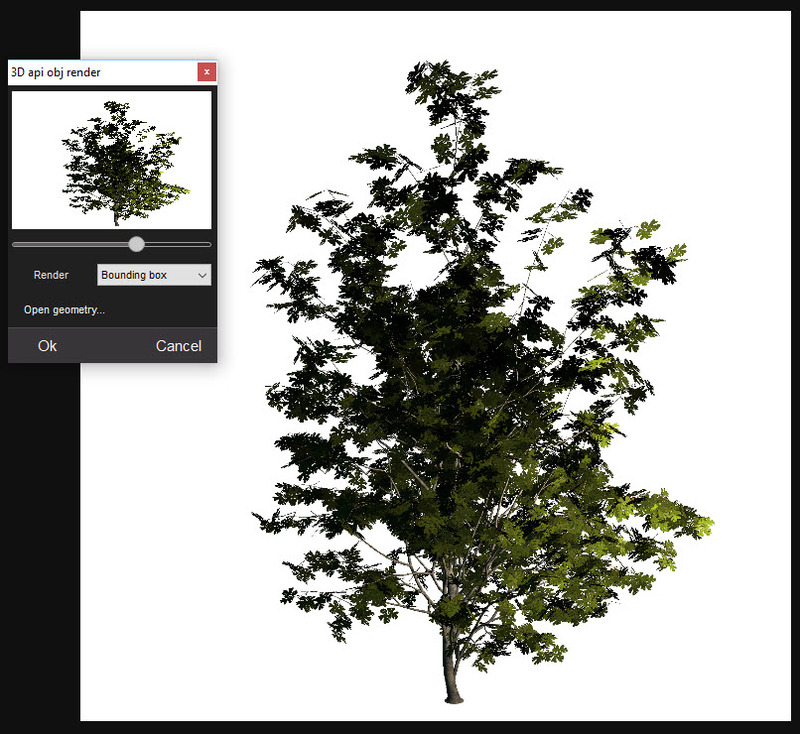 If you had the tree rendered against a plain color such as blue or white, you can easily turn it into an asset, a solid tree with transparent background. Pick it up with the Custom brush selector. 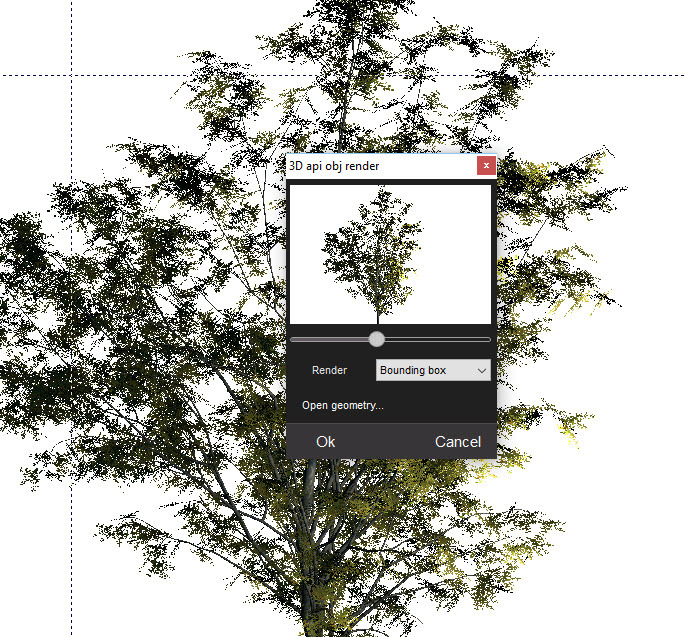 Use the selection marquis (rubberband rectangle) to select the part of the tree you want to pick up as custom brush. 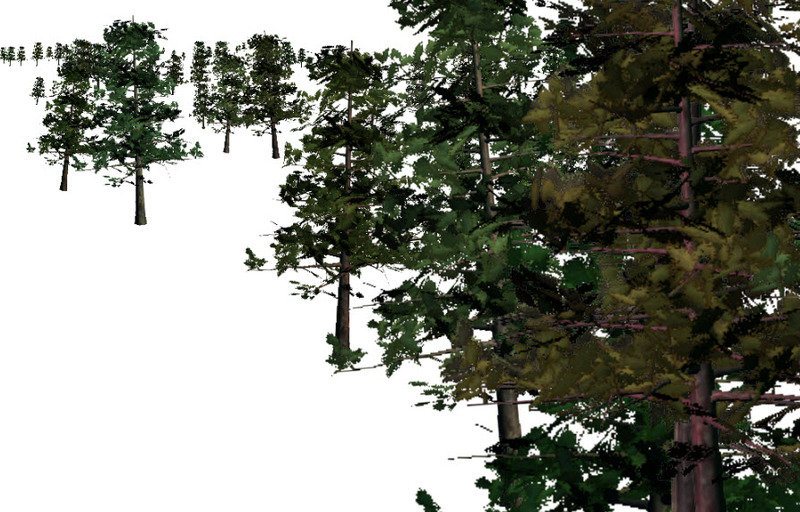 The selected tree is now in a stored brush. You can use it to paint with it or stamp it. The background became transparent because it was the same color (white) as the secondary color. It doesn't have to be white. It just has to be the same as the secondary color. 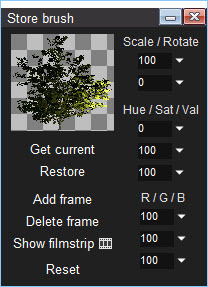 You can also right-click the Custom brush selector to change the eying, pick a different color from the image to be transparent, etc... and there are more keying options in the Brush menu. You may still notice a slight veil of glowing color around the edges of the tree. 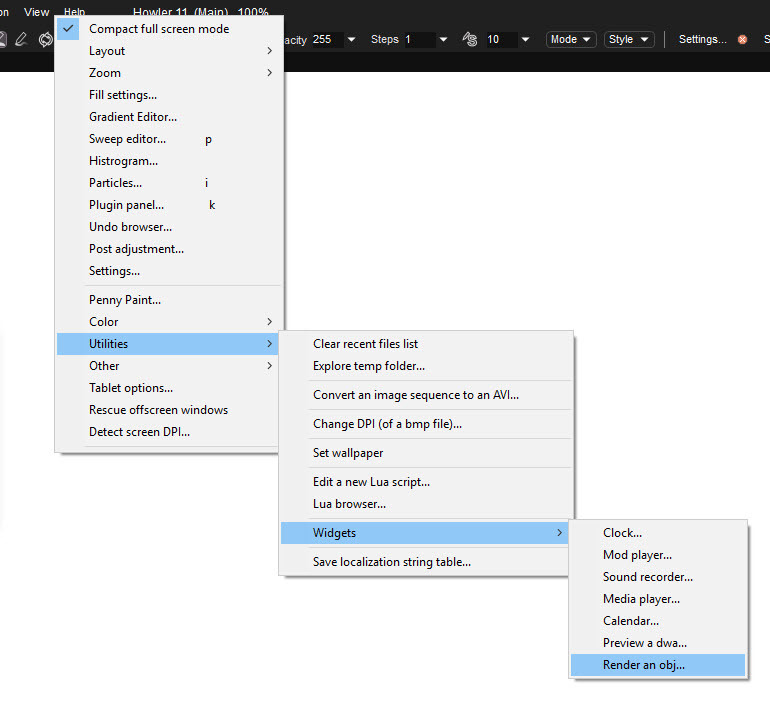 Use menu:Brush > Premultiply Correction to remedy that. You can then paint wth that custom brush, perhaps with extra effects on the brush such as random size, random position, random hue and brightness too. Below is an example with one of the Pine trees. 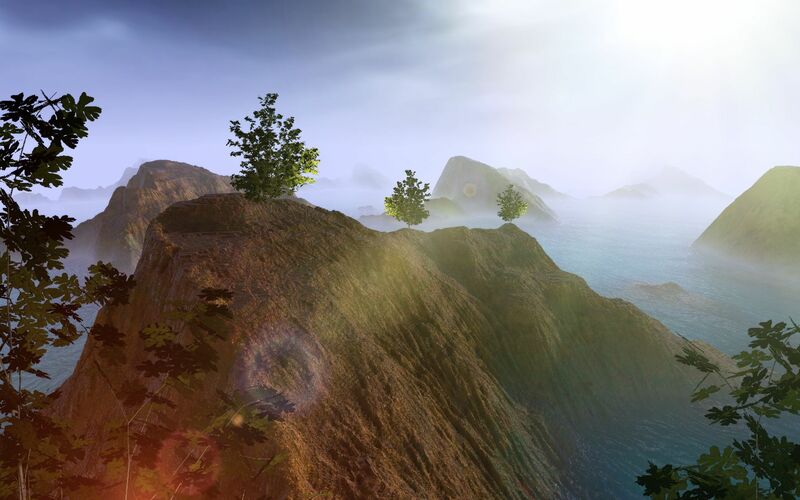 We also used the Z-depth gradient to automagically get them to appear smaller in the distance. We gave it a slight random sizing, and even slight random angle, so that they don't all appear perfectly vertical. 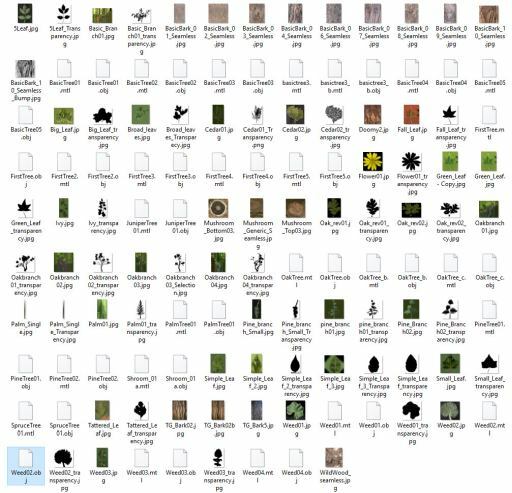 There are other trees: it's not a big collection yet, but you can easily turn them and generate very different versions from the 3D tree, moving in closer, up/down too etc.... and once it's rendered you can change ue, saturation and brightness and further turn it into many variants. 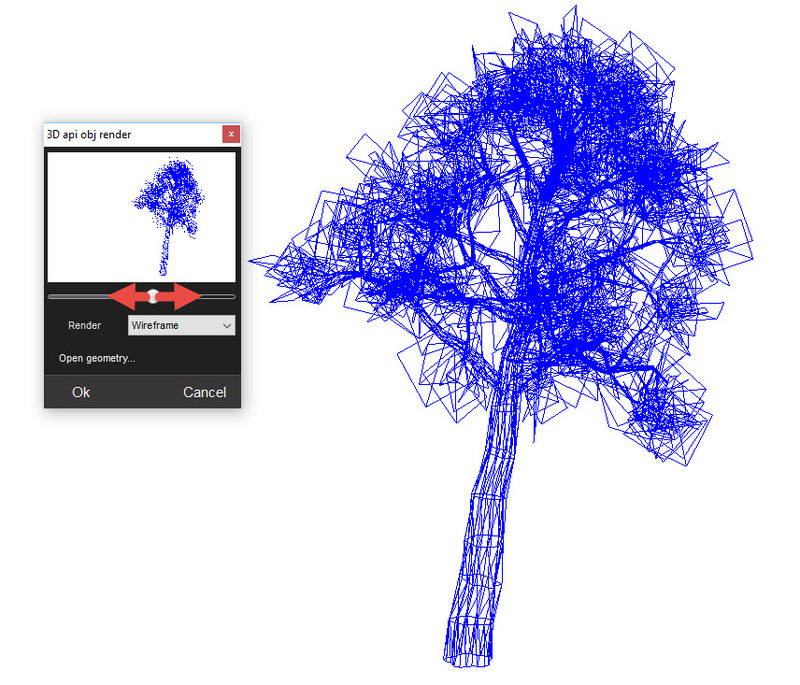 Have fun with 3D OBJ trees!